One of the most-awaited team chess events is round the corner. 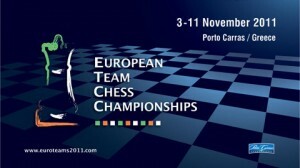 The European Team Chess Championship will take place 2nd to 11th of November in Porto Carras, Greece. 38 countries participate in the open section, with 135 GMs and 175 titled players. The countries participating in the women section are 28, with 11 GMs, 40 WGMs, 27 IMs and a total of 123 players. You can access the official website for all the updates and right here at www.chessblog.com through the tournament. The European Team Championship will be held on the Swiss system in 9 rounds, with one open section and one section for the women’s teams, considered as separate competitions. According to ECU and FIDE rules, the time control will be 90 min for 40 moves + 30 min for the rest of the game + 30 sec increment for every move played starting from the first move. The games of the European Team Chess Championships 2011 will take place in the Olympic Hall Congress Center (1500 sq. m.), within the 5-star Porto Carras Grand Resort. The luxury Porto Carras Grand Resort is situated in an enchantingly verdant landscape in Halkidiki, Greece. As seen above, up to 1992 the ETCC was always won by the ex-USSR but from 1997 the title has been won by other European countries as well: Russia, England, Armenia, Netherlands and Azerbaijan had all a “gold” title! Going to be a great event for sure. Hope to go and watch! Russia it will be in both sections this time am sure.